In Field of Dreams, Ray Kinsella hears a voice. "If you build it, he will come." He has no idea what it means. Maybe he's going nuts. Most entrepreneurs probably know the feeling. Although skeptical, when Terrance Mann sees the ghostly baseball players, he gets it. Something inspirational is happening, something that will draw people to it just because it is sincere and true. Ray thinks he's crazy for bringing his family to the edge of financial ruin but Mann says, "People will come Ray, people most definitely will come." How can you be sure you can trust your inner voice? In some intrinsic way, people respond to the truth. Politicians and cynics may believe that the bigger the lie, the easier it is to get people to fall for it, but the truth is that in the business world, lying or cutting ethical corners is expensive. It leads to damaged reputations, lost customers and law suits. Ethical companies attract loyal customers and employees. Unethical companies attract skeptics. Public relations firms exist to help companies tell the truth, yet there is a common perception that PR pros are spin doctors. Perhaps this is because the profession was founded by someone who perfected the art of manipulating public opinion. Last night a group of Denver PR leaders listened to author Larry Tye talk about his book The Father of Spin: Edward L. Bernays & The Birth of PR. 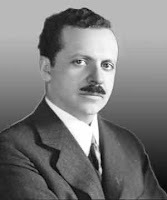 Bernays is considered the "Father of Public Relations." He opened the first PR firm in 1919. He coined the term public relations counsel and wrote several books, including Crystallizing Public Opinion (1923) and Propaganda (1928). Bernays figured out that the best way to sell a product was to turn it into a social cause, so he helped the American Tobacco Company make it acceptable for women to smoke by calling cigarettes Torches of Freedom. In 1929, he originated the concept of the global media event by getting power companies to go dark at exactly the same time to celebrate the 50th anniversary of the light bulb. He pulled this off on behalf of his client, General Electric. Bernays had a dim view of the public. He was convinced he could manipulate public opinion to suit whatever objective his clients wanted. Influence the opinion leaders and you capture the people who follow them. The problem is if the public finds out you were lying it will take much more than opinion leaders to get them back on your side. The Father of Public Relations was wrong. Public relations is more than propaganda or publicity gimmicks. It is a strategic approach to how businesses communicate. Public relations helps entrepreneurs listen to their inner voice by asking essential questions like What do we stand for? and Why are we here? If you can't answer these you need to do some soul searching. People need to understand why you are in business and what makes your business special. PR helps create companies that people feel good about by building ethical corporate cultures that inspire long term brand loyalty. And doing so from the start is much easier than repairing a corrupt culture after it becomes infected with deceit. A few years ago I met a delegation of government ministry public information officers from Azerbaijan. In their language, the word for public relations is propaganda. They were fascinated to learn that American PR firms did more than just parrot the party line. They were also surprised to learn that PRSA members adhere to a professional code of ethics that allows us to practice honest persuasion but prevents members from counseling clients or employers to engage in any sort of dishonest manipulation. Public relations can help you build a transparent corporate culture based on honesty, to evangelize your brand by communicating your passion to your employees, and to establish a reputation that attracts loyal staff, customers, clients, patients, investors, donors, or partners. If you build this kind of company, people will come. They most definitely will come.